Arizona’s Sen. John McCain, the Republican chairman of the Senate Armed Services Committee, attending the International Security Forum in Halifax, Nova Scotia on Sunday, said that any attempt to bring back waterboarding, an interrogation technique that simulates drowning, would quickly be challenged in court. However, the technique was banned by President Barack Obama using an executive order not legislation passed by congress. In the midst of the presidential race with then presidential candidate Donald Trump calling for a return to aggressive interrogation techniques, McCain and CIA Director John Brennan had said that the spy agency will not use controversial interrogation techniques, such as waterboarding, even if ordered to do so by a future president. 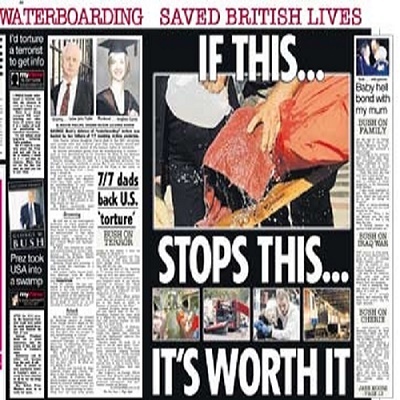 British news stories highlighted how the CIA was able to warn them about an attack because of their waterboarding a jihadist in Pakistan. While the news media are applauding his statement, critics believe the time has come for a more devoted warrior to head the CIA rather than a political hack for an administration that prides itself on espousing Obamaism, a/k/a political correctness. President Barack Obama prohibited waterboarding shortly after taking office in 2009. However, Republican presidential front-runner Donald Trump has repeatedly promised that he would revive the practice if elected. Ted Cruz, Trump’s greatest rival for the GOP nomination, said during a debate that he would use the practice, stating that he also didn’t believe the practice amounted to torture. 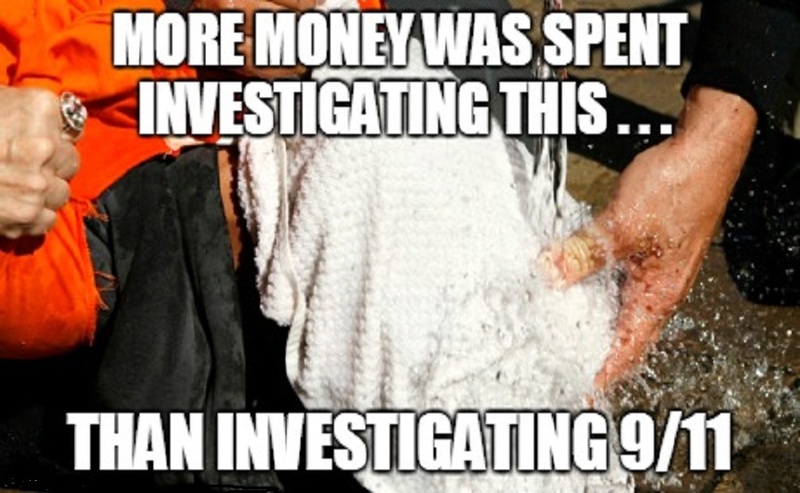 In December 2014, Democrats on the Senate Intelligence Committee released a report claiming the interrogation methods used by the CIA in the months after the Sept. 11, 2001 attacks were “brutal and far worse” than the agency had represented to lawmakers. Many working in the intelligence community, the military complex and in law enforcement said the report was heavy on denigrating the CIA and the war on Islamic terrorism but light on facts to back up the assertions. But, President Obama was well-pleased with his CIA director. “In John Brennan the men and women of the CIA will have the leadership of our nation’s most skilled intelligence professionals,” said Obama. “That unique combination of smarts and strength that he claims comes from growing up in New Jersey,” the President added. Some of the nation’s top intelligence, military, national security and law enforcement experts once loudly called for Homeland Security Advisor John Brennan to resign from his post or for President Barack Obama to fire Brennan from his White House staff. 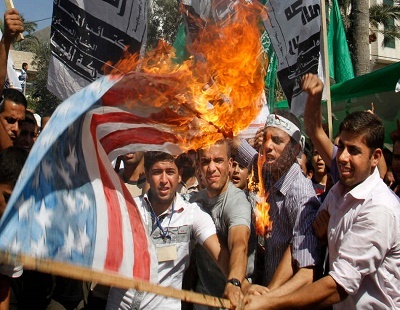 Palestinian Hamas supporters burn a U.S. flag during a protest. And they did this during Obama’s “weak-on-Islamists” presidency. A major piece of evidence that points to the dangers associated with Brennan’s failure to perform his primary function—to know the enemy and its threat doctrine—came to light when analysts at the Florida Security Council discovered that a known Hamas operative and unindicted co-conspirator in the largest terrorism financing trial in U.S. history (Holy Land Foundation),Sheik Kifah Mustapha,participated in a six-week-long, government-sponsored “Citizens Academy” hosted by the FBI as part of its outreach to the Muslim community. During the six-week FBI program, Mustapha—a man tied to an officially designated terrorist organization—was escorted into the top secret National Counterterrorism Center and other secure government facilities, including the FBI National Academy located on the Quantico, Virginia U.S. Marine Base. “Mr. Brennan is, at best, willfully blind to the threat posed to the homeland and national security of the United States by those who adhere to shariah. In the wake of this recent episode at the National Counterterrorism Center, in which the FBI gave a guided tour of one of our most sensitive counter-terrorism facilities to a known Hamas operative, it is clear that the cluelessness fostered by Mr. Brennan is causing an empowering of the wrong sorts of Muslims in America—and endangering the American people,” said Gaffney to reporters. Several parts of this report are taken from writer Jim Kouri’s analysis for Major General Paul Vallely (U.S. Army-Ret.) and his organization and web site Stand Up America.